The nine pointed star is a symbol of the Baha’i Faith, accordingly I baked these cookies for a friend who is a member of the Bahai’ Faith. 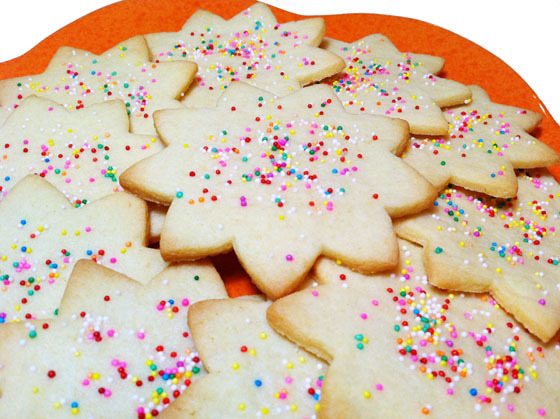 The cookies are in the shape of a nine pointed star to add to the symbolic meaning and general festive nature of Ayyam-i-Ha. My friend was very surprised by this simple gesture and in turn shared these delicious cookies with me and my family. Prepare one batch of your favorite sugar cookie recipe. Cut out 9-pointed stars with a sharp knife. (You can make a stencil by drawing the image on cardboard and using it as a guide to cut out the cookies.) Decorate with multi colored nonpareils and bake according to your recipe’s directions. Sugar cookies are delicious served with tall glasses of milk. Enjoy!